My fiance and I are not religious, so when we sat down to figure out our ceremony, we had to think creatively about what we wanted to do. 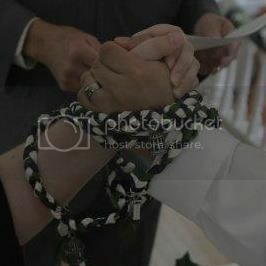 A handfasting was always one possibility. I have a lot of Celtic blood, and he has some as well, so the fact that it had some cultural significance for us was a plus. Green: We will begin the hand-fasting ceremony with Lindsay's father. He is presenting the first cord, Green, wishing his daughter and son the Nourishment of Family and Love. Much like sun and water, these elements will allow their union grow into a home shared with each other, regardless what garden the two find themselves in. Silver: The second cord woven of silver is being presented to the couple by Matt's mother. Silver traditionally represents wisdom and respect, and let it be so here today. Let this cord not only represent the wisdom the two of you have shown in taking this step together, but may it also serve as a blessing, so that this union remains strong enough that life never grinds the two of you down to the point that you take each other granted. burning embers of lifelong Passion. Orange: Matt's father will be tying the copper-orange cord. With this cord, he brings a blessing of playfulness and fun, reminding the pair to keep young hearts; for next to each stands the person who will be their best friend and companion, and it is only through play, fun, and joy that we can keep from growing old, regardless of growing older. Yellow: It is Lindsay's mother that brings forth a blessing of light and nourishment to the young union as represented by the yellow cord she ties around the couples hands. May you find in each other a balm for your emotional hurts and may you find yourselves sharing more joys together than sorrows. Pink: Matt's sister will be tying the sixth cord, pink, bringing to the couple a blessing of spontaneity to their lives. Memories are not only made of grand moments, but are also hiding in the simple adventures of daily life. May the two of you remember to allow your lives to dictate your schedule, and always remember to make time for life to happen. arms, and keep each other centered; and when one of you stumbles, know that the other will catch you before you can fall. on the couple as they explore so many different mysteries together. Mysteries not only imposed on them from without, but the mysteries hidden within each other and this brave new adventure they embark on. When it came time for the handfasting part of our ceremony, each of our family members came up to us, they wrapped the cord around our hands and then had a small moment with us. It was very intimate and wonderful. I really didn't understand how much emotion would flow through me while I was standing up there, how close I would feel to everyone/everything that I encountered, and having both my family and his to share that with us was amazing. My name is Morgan. I'm a video game designer and irrealist writer by trade, which fortunately allow me to pursue my passion: which is filling the world with whimsy and wonderment. Just reading this made me want to cry! Love it! Love it!This is helpful because I want our cords to be color-meaningful, but the only thing I can think of is grey for compromise and meeting in the middle. We'll only be using 2 cords, but if we braid them out of ribbon, that gives us up to 6 colors. Kirstin – you can also do a 4 cord braid if you desire more colors. It was far easier than I would have thought once you get the hang of it. I found myself chanting "Under two over one" (this was a great tutorial here: http://www.youtube.com/watch?v=NLjs_MeGNpo) Good luck!! Wow! I LOVE this. My FH and I have been pondering ways to have our siblings (6 total) be involved and feel honored in the ceremony. This would be a great way to integrate it. We did something very similar to this and it was easily one of the most meaningful parts of the wedding for me. Despite potential family drama, it was just so beautiful and personal that I'm glad we did it. I would definitely recommend it to anyone. Wow! This is really gorgeous! I have been trying to thinking of how to incorporate family as well, especially siblings. This style of handfasting sounds amazing. Would you be willing to also post the introduction your officiant made before the handfasting began? I am struggling with exactly how much to explain about it etc. Would love to see how you dealt with that aspect. Also, about how long do you think it took? We would have six in total. Thanks again for posting this. what a beautiful idea! This is such a great post! My fiance and I want to incorporate this and it's a perfect way to do it. At what point in the ceremony did you do this? Thanks for sharing! I love the idea of the color coding and am doing something slightly similar. A dear friend and mentor of ours is making us a hand-fasting cord made of dyed and loom woven wool, the colors of the cord red black and white represent both of us, our pirate re-enactment group (a huge part of our lives and social community) and different parts of our lives. I love the idea of this, but I have some silly questions regarding logistics… How did you get out of the ceremony after this? Did you wear the chords back down the aisle? Did you take the chords off and put them someplace special? Did you tie both of your hands to both of your hands or just one hand to one hand? Hey! So I used a lot of the info from this post to help create our handfasting ceremony as well — Our wedding date is 6/20/14 – eek! We also decided to have multiple cords with various colors… problem is, we're unsure of how exactly to TIE the cords. Anyone, please help?! I have googled all sorts of phrases and looked on OBB and can't find anything specific for how to tie them.. we're wanting to tie them in order to remove them after vows. Any advice will be soooo helpful!!! This was absolutely beautiful, I've been looking to do something similar so I greatly appreciate seeing how others have done it! Stealing and tweaking for my ceremony. This is awesome! http://i228.photobucket.com/albums/ee121/Dead_spirit07/62505_4840946266261_798801658_n_zps07b4823b.jpg I love how ours was unique to us and took me a fair amount of time to make. I actually had a friend say I should make an etsy shop of em. 😛 Sorry, bragging isn't something i do often but dang it, i worked hard it! While I love the fact that people are using such a lovely tradition as their ceremony, it is a bit troubling to me that people are using it as a non-religious method. Hand fasting is NOT just a Celtic 'tradition' it is a Wiccan (read: religious) ceremony with very important meaning to those of us who practice and believe in the Wiccan religion. Please, I just ask that you all do some research, because this isn't just some hip, new age way to get married, it is a long standing, exceedingly important ceremony that has deep meaning for many of us who follow this oft-misunderstood and disregarded ancient religion. I appreciate that someone can encourage others to use traditions important to them not for the reason for a fad but doing research and appreciate the deeper meaning behind it and respecting its roots in history. I can actually agree with you that certain traditions need to be respected an appreciated instead of plastered all over a pinterest board, lol. You know it actually upset my grandparents deeply when I refused the tradition of doing regular vows and did my two favorite poems instead, "The Passionate Shepherd to His Love " that my husband read, while I read the following,"The Nymph's Reply to the Shepherd ". It was so beautiful and everyone loved it. I'm sorry if my own comment about using the ceremony had offended you in any way, it was not my intention of doing so. But its nice to know that along with actual traditions that we can do other small things that make our wedding uniquely ours like colored dresses,serving cupcakes, or playing games with guests. I would hope what counts the most that someone can pick certain traditions that have a deep meaning to them, can respect where it came from,celebrate it, and keep it alive in practice today.